Following an arterial occlusion outward remodeling of pre-existent inter-connecting arterioles occurs by proliferation of vascular smooth muscle and endothelial cells. This is initiated by deformation of the endothelial cells through increased pulsatile fluid shear stress (FSS) caused by the steep pressure gradient between the high pre-occlusive and the very low post-occlusive pressure regions that are interconnected by collateral vessels. Shear stress leads to the activation and expression of all NOS isoforms and NO production, followed by endothelial VEGF secretion, which induces MCP-1 synthesis in endothelium and in the smooth muscle of the media. This leads to attraction and activation of monocytes and T-cells into the adventitial space (peripheral collateral vessels) or attachment of these cells to the endothelium (coronary collaterals). Mononuclear cells produce proteases and growth factors to digest the extra-cellular scaffold and allow motility and provide space for the new cells. They also produce NO from iNOS, which is essential for arteriogenesis. The bulk of new tissue production is carried by the smooth muscles of the media, which transform their phenotype from a contractile into a synthetic and proliferative one. Important roles are played by actin binding proteins like ABRA, cofilin, and thymosin beta 4 which determine actin polymerization and maturation. Integrins and connexins are markedly up-regulated. A key role in this concerted action which leads to a 2-to-20 fold increase in vascular diameter, depending on species size (mouse versus human) are the transcription factors AP-1, egr-1, carp, ets, by the Rho pathway and by the Mitogen Activated Kinases ERK-1 and -2. In spite of the enormous increase in tissue mass (up to 50-fold) the degree of functional restoration of blood flow capacity is incomplete and ends at 30% of maximal conductance (coronary) and 40% in the vascular periphery. The process of arteriogenesis can be drastically stimulated by increases in FSS (arterio-venous fistulas) and can be completely blocked by inhibition of NO production, by pharmacological blockade of VEGF-A and by the inhibition of the Rho-pathway. Pharmacological stimulation of arteriogenesis, important for the treatment of arterial occlusive diseases, seems feasible with NO donors. are arteriolar collateral vessels pre-existent? can collaterals form de-novo? what is the primary growth stimulus: chemical (ischemia?) or physical? if physical, is it pressure or flow related? do angiogenic growth factors play a role and if yes which one? are stem cells, adult or precursor, important for arteriogenesis? To position this review we will briefly answer these questions and furnish more detailed elaborations further on. 2 Arteriogenesis: pre-existent and/or de-novo? Fulton  and Baroldi  provided incontrovertible evidence that coronary collateral arterioles exist in the normal human heart that are potentially able to grow into larger structures that are potentially able to save myocardium from necrosis. Zbinden recently supported this view with functional data in beating normal human hearts studied with intra-coronary measurements of wedge pressures and flow wires resulting in the collateral flow index [166, 167]. Seiler concluded that a well-trained normal human heart is able to survive an acute coronary occlusion with only minimal necrosis due to good collateralization . This view, that pre-existent arteriolar connections exist that enlarge by growth in response to arterial occlusion, still stands today but is supplemented by the opinion that capillaries may be able to recruit smooth muscle and that muscular collateral arteries can form de-novo . Being a possibility, final proof that this process exists in mammalian hearts, that it develops in the right place at the interface between a normoxic and ischemic region and that it is connected to an arterial pressure source and is able to save or salvage muscular tissue is still lacking. Collaterals do not form de-novo in the peripheral circulation of rabbits, rats and mice. In man preformed collateral pathways exist in the vascular periphery that enlarge when stenoses form in the iliacal arteries with little inter-individual variation and some are classified under specific names like “Riordan” collaterals (see Ritter in ref. ). In rats a particularly large collateral is visible with the unarmed eye after contrast injection already before occlusion which enlarges and carries most of the collateral flow . A finite number of interconnecting arterioles normally exists, 8 in C57BL/6J mice and 38 in rabbits, that enlarge after femoral occlusion [129, 156]. The number of pre-existing collaterals does not increase after arterial occlusion, not even after maximal stimulation by increased shear stress. The observed spurious increase in collateral number in the rabbit hind leg is due to the limitations of detection by X-ray based methods that recognize vessels only after they pass the threshold of detection by growth. 3 Is ischemia the stimulus for arteriogenesis? Arterial occlusion leads to ischemia and to the development of collateral vessels if conditions are favorable and the occlusion develops gradually. It is therefore suggestive to assume that ischemia is the stimulus for arteriogenesis. However, stenoses slowly progressing toward complete occlusions signify only minimal ischemia, and this is the condition where collaterals show their maximum of adaptation. Acute infarctions are very poor stimuli for arteriogenesis: scar tissue needs little perfusion. Often the ischemic region and the location of growing collateral vessels lie closely together, like in the heart, and make it difficult to decide where ischemia ends and normoxia starts and where exactly the growth occurs. However, Fulton had already pointed out that the stem (origin) of coronary collaterals in the human coronary circulation expands already in normoxic tissue , a consequence of the increased FSS. The problem is easier to study in the peripheral circulation because of the large distances between the point of arterial occlusion and the location of ischemia. In the rabbit, rat and mouse proximal femoral artery occlusion leads to ischemia in the lower leg but not in the upper leg where collaterals form  with the exception of the white Balb/C mouse, a strain known for its paucity of pre-existent collateral vessels . A strong argument against a role of ischemia stems from recent research in zebrafish where the occlusion of the aorta is rapidly compensated for by collateral vessel growth in an environment that cannot become hypoxic . An argument in favor of ischemia is the observation that it is indeed the stimulus for the transcription and translation of vascular endothelial growth factor (VEGF), necessary for the angiogenic sprouting of capillaries [93, 114, 133, 143]. We will explain later that VEGF is indeed a necessary component of arteriogenesis but that ischemia is not the stimulus for arteriogenesis because it is expressed in the endothelium of growing collaterals that are constantly perfused with well-oxygenated blood, and are by definition not ischemic. The skeletal muscles surrounding growing collaterals after femoral artery occlusion in black mice are never ischemic (tested by electron spin resonance resulting in normal muscular pO2 and by magnetic resonance spectroscopy resulting in normal ATP and PCR values) [62, 156] but collateral vessels develop nevertheless and much faster than in ischemic white mice under the same circumstances. Attraction of monocytes, essential for arteriogenesis, is strongly inhibited by hypoxia . Dogs, well endowed with native coronary collaterals, react much faster with growth to repetitive occlusions compared to dogs with a lesser-developed native collateral network [42, 43]. Thus, the lesser the ischemia, and the higher the FSS due to already present collateral vessels, the faster the growth. A prime example of shear stress-induced arterial growth without accompanying ischemia is the outward remodeling of the uterine artery during pregnancy . We conclude therefore that ischemia, often present at the time when collaterals develop, is not necessary to explain the growth of collateral vessels. It could still be argued that the venous return from the ischemic lower limb in femoral artery occlusion carries growth factors into the region where arteriogenesis takes place. Although this is an untested hypothesis we can argue that in our high shear stress model where the collateral flow was shunted directly into the venous system the veins are perfused with arterial blood and the extremely high shunt flow would markedly dilute the infinitely small amounts of hypothetical factors. The initially and only briefly ischemic lower leg in black mice  recovers fast due to the increase in collateral flow but also due to the decrease in metabolism  probably by hibernation and preconditioning causing the rapid restoration of tissue hemoglobin saturation at times of continuing active collateral growth . Anecdotal evidence exists from case reports where due to war wounds AV-shunts persisted in the upper leg with the typical increased vascularization in spite of lower leg amputation. 4 Pressure- or flow-derived stimuli? It is generally assumed that a physical stimulus starts the remodeling process whereby increased pressure leads to increased wall thickness and increased flow to increased arterial diameter. Pressure-dependent forces are by far the highest in magnitude and they affect both the endothelium as well as the muscular media. It is therefore logical to assume that these are important factors for remodeling [83, 121, 122]. Vasodilatation of the collateral arcade, which occurs after arterial occlusion, may increase circumferential wall stress according to Laplace’s Law because diameter increases and wall thickness decreases, however, pressure falls precipitously after occlusion and it is questionable whether circumferential wall stress changes significantly. However, in collateral growth with its pressure gradient driven increase in flow the much weaker FSS, which the viscous drag of flowing blood exerts on the endothelial lining, is the determining force [8, 17, 35, 49, 85, 114, 142, 145, 149]. However, pressure derived pulsatile stretch is also discussed [83, 88, 110] and the transcription factor AP-1 is the molecular transducer. However, AP-1 is also activated by FSS . Pulsatile stretch can only be tested acutely and in vitro with its inherent limits. Cultured endothelium under stretch alters translation and transcription of growth factors and changes the sensitivity to cytokines[14, 32, 110]. If pulsatile stretch is a molding force it must be demonstrated that in collateral growth pulsatile stretch is higher than the physiological levels in normal small arteries. Furthermore, in arterial occlusion the intravascular pressure downstream from the occlusion (and hence in the receiving end of the collateral arcade) is much lower than the systemic arterial pressure (100 mmHg proximal, 30 mmHg distal) and the probability of increased stretch is low under in-vivo conditions. In order to test the influence of physical forces we designed an experiment where post-occlusion pressure was lowered even more and where flow was drastically increased by shunting the collateral flow directly into the venous system, which maximized collateral growth [35, 106]. This experiment clearly demonstrates that flow dependent forces had dominated growth. Although there is compelling evidence that FSS is the primary morphogenic physical factor that determines the size of an artery and in particular the size of a growing collateral vessel, several problems still exist [85, 113, 114]. FSS is a weak force that acts only on endothelial cells in addition to the circumferential wall stress (up to over one thousand times higher) that acts both on endothelium and on the smooth muscles of the media. It is at first difficult to understand that the weak force directs the fate of the structures that cope with and resist the strong force. However, numerous physiological examples can be cited where weak forces function as amplifiers. Another difficulty arises from the fact that FSS falls precipitously with the 3rd power of the radius when it increases due to growth. One could argue that flow increases, according to Poissieulles Law, with the 4th power of the radius so that with any increase in radius sufficient shear stress remains. However, these musings do not reflect reality because flow in the arterial circulation is never ideally laminar and the exponent of the radius is probably much less than 4 [58, 161]. By analogy the r-exponent in the shear stress equation is therefore most certainly less than 3 because the condition of laminarity is also not met. Tortuosity, the typical feature of collateral vessels, makes the issue of FSS even more complex because shear stress in the outer curvature of a bend is probably higher than the radius at that point would predict. Curvature flow, as described by the Dean Equation  is part of the resistance in tortuous collateral vessels but shear stress can be imagined to be highest at the outer curvature. Three observations suggest the leading role of the endothelium in arteriogenesis: endothelial denudation of the a. iliaca prevents positive remodeling after an experimental AV-shunt , L-NAME and other more specific inhibitors of eNOS prevent arteriogenesis and remodeling of collateral vessels, and after arterial occlusion dedifferentiated smooth muscle cells (SMCs) migrate toward the endothelium before they divide and form the intimal layer of new cells. If Circumferential Wall Stress (CWS) were the morphogenic influence, proliferation should have commenced at the outer, adventitial, SMC layer, which according to the Law of Laplace, is markedly more stretched. How are signals, generated in endothelial cells, translated into a growth stimulus for the smooth muscle layer of the media that is separated from the endothelium by the internal elastic lamina? We as well as others were unable to find endothelial-to-smooth muscle junctions in collaterals [122, 125], which reduce the means of communication to diffusible transmitters, like NO, oxygen radicals, endothelin, and diffusible factors like VEGF. Co-culture studies with endothelial- and SMCs in close contact do not necessarily reflect the in-vivo situation. This is highlighted by reports showing that FSS decreases the expression of MCP-1 in cultured endothelium, which is in contrast to the in-vivo situation, and that FSS and NO reduce monocyte attachment in vitro but the exact opposite occurs during collateral artery growth [125, 146, 147, 168]. Are special organelles like cilia, that protrude from the endothelial surface and float in the blood stream and sense velocity, shear stress transducers [67, 101, 108] or is the deformation of the entire endothelial cell, the tensegrity model of Ingber, required for gene activity typical for vascular remodeling [72, 73, 74, 75]? In our work in peripheral arteriogenesis the presence of cilia could not be verified on the basis of transmission and scanning electron microscopy. Deformation of the endothelium under high FSS is a typical feature of early arteriogenesis and is amplified by the intracellular edema and loss of volume control by activation of ion channels . This would stress the cytoskeleton similarly as in the tensegrity model. Mathematical modeling of vessels arranged in parallel showed that FSS cannot be an organizing principle of vessel growth because the model predicts instability with a preference for few but large vessels . However, this reflects arteriogenic reality rather well. After arterial occlusion many pre-existent arterioles that are arranged more or less in parallel start to grow but finally only a few large ones emerge and the others are pruned away . Increased FSS stimulated growth at first but ended when the competition had favored the large vessels offering less resistance and normal FSS . The reason to study the role and development of coronary collateral vessels in the mid1960s was the urge to find a new role for the powerful coronary vasodilators that had been developed in the wake of the success of Dipyridamole , developed with the idea that vasoconstriction was the cause for angina pectoris. Nitroglycerine, because it relieved the pain of angina pectoris, was believed to relax spastic coronary arteries but was too short acting and hence longer acting vasodilators should improve the therapy of angina. However, the newly developed coronary angiography confirmed earlier pathological findings, in that coronary stenoses were structural and not functional barriers and there was hence no place for vasodilators. These, when applied in high doses, caused angina instead of preventing it, a property shared with high doses of nitroglycerine . On the other hand it was widely accepted that FSS, caused by increased flow velocity, i.e., by vasodilatation, is the molding force for collateral vessels, at least in the vascular periphery . Chronic coronary vasodilatation should therefore support collateral enlargement. When we started to study the influence of a long acting orally active coronary vasodilator, lidoflazine [127, 152], we noticed the paucity of functional data about the collateral circulation. Although the research by Fulton and Baroldi showed ample evidence of their existence in the normal and pathological human heart, nothing much was known about the mechanism of their structural enlargement. The prevailing view was that they enlarged by stretch because they appeared very thin walled [36, 45]. Also their ability to functionally replace the occluded artery and to what degree was unknown . We could show, by in-vivo pulse-labeling with tritiated thymidine and uridine, that pre-existent coronary collaterals enlarge by active proliferation of endothelial cells which preceded that of SMCs after DNA and RNA synthesis [25, 102, 123]. The degree of adaptation by growth was impressive: in the canine heart (after gradual coronary occlusion) the collateral diameter increased up to 20-fold and the tissue mass increased up to 50-fold. To test for functional capacity was more difficult: only pressure-derived indices were initially available. Peripheral coronary pressure measured in the distal stump of the occluded artery was a good estimate when divided by aortic pressure and when the measurement was carried out under maximal vasodilatation. The theoretical and experimental studies, that we carried out in the mid 1970s for the validation of the collateral flow index (CFI) [104, 105, 126, 132], are today used by clinicians in beating human hearts [104, 166]. 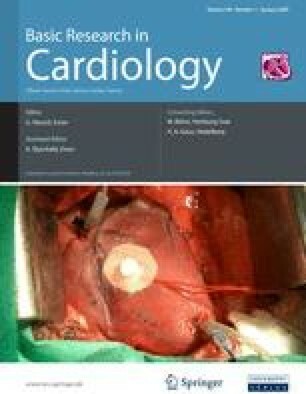 A much more precise method to measure coronary and collateral flow was the then (1970) newly available tracer microsphere technique that we perfected using semi-conductor crystal detectors and a computer controlled automaton . Our tracer studies showed that in spite of the tremendous growth of collateral vessels only one third of the maximal conductance was replaced . This is sufficient for the resting state and mild activities but not for heavy physical exertion . A wide margin for improvement exists therefore for therapy. Our studies were later confirmed by Epstein’s group, who arrived at exactly the same degree of adaptation . Study of the histological structure and ultra structure revealed that both endothelial as well as SMCs went through a stage of dedifferentiation: SMCs lost their contractile phenotype and assumed a synthetic and proliferative phenotype, the latter also prevailing in endothelial cells. The most striking change was the migration of dedifferentiated SMCs toward the endothelium, apparently an attractor. This was enabled by the fragmentation of the internal elastic lamina. By employing scanning and transmission electron microscopy in the study of collateral vessels at various stages of maturation  we noticed in 1975 that monocytes had attached to the formerly smooth but now “rocky” endothelial surface at early stages of the development  and had subsequently entered the sub-endothelial space. The adventitial space became invaded by bone marrow derived cells, mostly T-lymphocytes, and it became clear that the process of arteriogenesis exhibited an inflammatory scenario . Treatment with anti-inflammatory drugs retarded the growth process showing that it was an essential element . In the early 1980s the first angiogenic growth factors (GF) became known, notably PDGF  and FGF , the latter isolated first from brain tissue. Since my interest was focused on coronary collaterals our group tried to find a factor produced by the myocardium. Using a combination of chromatographic methods we finally purified a very potent mitogen for endothelial and SMCs from kilograms of bovine hearts. The amino acid sequence revealed that it was an already known factor, namely prostata growth factor, which was shortly thereafter identified as acidic Fibroblast Growth Factor, aFGF or FGF-1 [13, 112]. It was at first difficult to study the role of the FGFs-1 and -2. Because of the perfect evolutionary preservation of the genes it was not easy to produce an antibody and even the construction of a probe for in-situ hybridization had to take the detour via the chicken sequence. When finally an antibody became available we had FGF-1 adsorbed to porous micro-beads and, when injecting them into the porcine coronary circulation, we could indeed show by immuno-histochemistry the leaching of the factor from the bead, its take-up into cells, its transport into the nucleus and the subsequent mitosis . However, mitosis was only observed in interstitial fibroblasts but not in smooth or cardiac muscle cells. And the frequency of mitosis paled in comparison with that of fibroblasts after myocardial necrosis. In growing collateral vessels after ameroid-induced coronary occlusion we found FGF-1 in invading monocytes . This renewed our interest in monocytes, especially since we found that porcine hearts challenged with micro-embolism (Mohri in ) to stimulate angiogenesis markedly up-regulated the chemo-attractant JE, later called MCP-1, (monocyte chemo-attractant protein1) [78, 157, 165]. The necessity to use smaller animals (new animal protection legislation) forced us to abandon the study of the coronary collateral circulation, first, because the ameroid technique of gradual coronary stenosis was not applicable in mouse or rat hearts (a recent report from Chilian’s group showed that this has become feasible in the rat heart ), and second, because pigs did not develop muscular collaterals . We concentrated therefore on the peripheral circulation of the rabbit, rat and mouse, which reduced the complexity of the experiments because ischemic tissue loss played a relatively minor role even after acute occlusions with the exception of the white Balb C mouse with its poorly developed network of peripheral collateral vessels [62, 130, 151]. The role of monocytes was tested by infusion into the rabbit hindlimb of MCP-1 using osmotic minipumps and it indeed stimulated arteriogenesis markedly [77, 78]. The role of monocytes was further strengthened by experiments showing that the monocyte stimulant LPS, a Toll-like receptor ligand, markedly stimulated arteriogenesis  and over-expressed TNF-α [2, 68] but that reduction of blood monocyte count with 5′-fluoro-uracil inhibited arteriogenesis [2, 59]. Femoral ligature during the monocyte rebound from cytotoxic treatment stimulated it. Elimination of monocytes with nano-encapsulated bisphosphonates strongly inhibited arteriogenesis . Over-transfusion with monocytes stimulated arteriogenesis [59, 63] but animals genetically lacking these cells (osteopetrotic mice and rats) were almost unable to develop collateral vessels . Genetically targeted mice lacking the gene for MCP-1  and mice lacking the gene for the MCP-1 receptor (CCR2) exhibited a severely limited ability to adapt to femoral artery occlusion . These findings and our observation that monocytes produce paracrine growth factors may have been the basis for the recent clinical and experimental interest in adult bone marrow derived stem cells (which share markers with monocytes and EPCs) for the regeneration of arterial tissue. Murry in his Nature article supported this view . The increase in FSS as it occurs as a consequence of increased collateral flow due to the steep pressure gradient across a stenosis or occlusion, tends to prevent the attachment of monocytes and so we studied the expression of adhesion molecules as a counterforce and we found ICAM-1 and VCAM-1 greatly increased on the endothelial surface and in the media of growing collaterals, more so in shunt stimulated collaterals [106, 128]. Injection of antibodies against ICAM and injection of the ICAM antigen reduced collateral development because the antigen binds to the circulating monocytes and the antibody blocks the docking site . These experiments supported strongly again the important role of monocytes in arteriogenesis. Van Weel and co-workers as well as Epstein and his group had recently shown that other leukocytes also contributed to arteriogenesis, mainly T-lymphocytes, NK-cells and CD4 and CD8 cells [137, 138, 151]. Endothelial progenitor cells were claimed to home toward growing vessels and change their phenotype into endothelial, smooth muscle and even to cardiac muscle cells [80, 140]. Bone marrow derived cells from EGFP chimaeras do indeed home toward growing collaterals but never incorporate into the vascular wall and do not change their phenotype but exhibit paracrine activity instead . Roughly 4 stages in the development of a pre-existent collateral arteriole into a mature small conductance artery can be identified. Following a critical stenosis or an acute occlusion a relatively silent phase of up to 2 days follows where nothing much happens in terms of blood flow increase. This is due to the fact that the cell cycle and events leading to it require about one day at which time point bone marrow derived cells attach to the endothelium and gather in the adventitial space. The hallmark of the first phase is the phenotypical change of endothelial and SMCs into synthetic and proliferative ones with increase of vascular permeability. The second phase is characterized by the controlled destruction of the collateral vessel by digestion of the extra-cellular scaffolding like internal elastic lamina and extra-cellular matrix simultaneously with a burst of mitotic activity of SMCs and endothelial cells where the ECs precede that of the SMCs by about one day. Phase 3 is the maturation phase characterized by orderly arrangement of the SMCs in circular layers, by establishment of cell-to-cell contacts and by synthesis of elastin and collagen to produce the new scaffold for the much larger vessel. Phase 4 is characterized by pruning of vessels that had initially participated in the remodeling but are eliminated by the competition for flow: those with the initial advantage of a slightly larger diameter reach maturation but many others close by overshooting intimal proliferation comparable to the closure of the stump of an occluded artery . 8 Structural restraints prevent full restitution of function? The inability of exogenously applied angiogenic growth factors to fully restore the maximal conductance after arterial occlusion led us to tackle the thus far unanswered question: are collaterals actually able to fully replace the occluded artery? Can the limit of between 30% and 40% restoration of physiological conductance by collaterals be surpassed? Why does collateral growth stop prematurely? Is the tortuosity and increased length of collaterals an anatomical limit? In order to test that problem we designed an experiment where the pressure gradient along collaterals was further increased and maintained for a relatively long time. This was achieved by creating a side-to-side anastomosis between the distal stump of the occluded artery and the accompanying vein, creating an arterio-venous shunt where the collateral blood flow was largely shunted directly into the venous system, which increased markedly collateral flow and FSS. This procedure greatly stimulated arteriogenesis and functionally replaced the occluded artery already after one week and increased the maximal conductance at 4 weeks after occlusion by a factor of two [35, 106]. With this experiment we showed that the 30%–40% of spontaneous restoration of function was not caused by anatomical restraints but rather by the premature normalization of FSS, which falls with increases of the vessel radius by the 3rd power. Our studies show that therapeutic efforts are not doomed to fail because of anatomical restraints and a reference point is defined that could and should be reached by therapy. The reasons for premature stop of growth are twofold: shear stress falls not only because the vessel radius increases, as discussed but also because metabolic autoregulation limits blood flow to the actual need of the tissue. Our findings that the FGF-1 protein is expressed in the heart , that application of FGF-1 to heart muscle stimulates mesenchymal cells to proliferate , that monocytes loaded with FGF-1 home-in on places where collateral vessels develop, that the FGFR-1 is expressed in SMCs of growing collaterals and in fibroblasts of the adventitia  and that transgenic myocardial over-expression increased arteriogenesis and arterial branching in the heart  were at first interpreted that FGF-1 is the growth factor of arteriogenesis . Transgenic over-expression of FGF-2 in skeletal muscle under the control of the phosphoglycerate promoter resulted in complete restoration of blood flow after femoral artery occlusion, especially when combined with physical exercise . Peripheral arteriogenesis following femoral artery occlusion could be inhibited by PAS (Polyanetholsulfonic acid), which blocks the action of FGF by complex formation, which impairs binding to the FGFR-1 . FGF ligand availability did not change, therefore regulation of arteriogenesis seemed to proceed via receptor availability. In spite of all of these findings the FGF-hypothesis has a low probability because gene-targeting of FGF-1, of FGF-2 and the double knockout of FGF1 + 2 responded like wild-type mice to femoral artery occlusion . Except for changes in tibia length the animals were normal and fertile. Since the FGF family is large the assumption was that other members had substituted in the gene-deleted animals. Adenoviral transfection of rabbit skeletal muscle with FGF-4 stimulated arteriogenesis but no evidence is available that collateral formation was stimulated in the FGF-1,-2 double knockouts by FGF-4. Although FGF-7 is strongly expressed in cultured porcine vascular SMCs, especially when stimulated with PDGF, no differential expression was found so far in developing collaterals. Mouse knockout studies of FGF-7 showed no impaired wound healing . However, the triple knockout of FGF 5, 6 and 7 markedly inhibited the recovery of blood flow after femoral artery occlusion (Zimmermann et al. unpublished). In spite of the fact that external application of FGF-1, -2, FGF-4, and -5 stimulate arteriogenesis [48, 87, 150], from about 40%–50% of physiological maximal conductance, their internal role in collateral vessel development remains uncertain. An enormous amount of research was generated by the discovery that vascular endothelial growth factor (VEGF) played a crucial role in the embryonic genesis of the vascular system. No offspring issued from targeted deletion of the VEGF gene and not even heterozygote knockouts were viable [21, 39]. Numerous studies were published showing that application of VEGF either by protein or gene transfer could reduce hind limb ischemia after femoral artery occlusion in animals [7, 76, 164]. But in analogy with the pioneering work of Epstein with FGF, complete restoration of function of the occluded artery was not reached. Our recent studies showed that VEGF-A protein is indeed expressed on the endothelial surface of growing collaterals which explains the mitotic activity of the endothelium but not of the SMC proliferation at a distance from the endothelium, especially because VEGF is not a mitogen for SMCs. However, a combination of activated autologous EC and SMC by transduction with Angiopoietin-1 and VEGF retroviral vectors, respectively, produced arteriogenesis in a hind limb ischemia model in miniature pigs . Recent studies by Terjung et al showed that the arteriogenesis of exercise can be inhibited by the VEGF antagonist ZD4190 . Questions remain as to the mechanism of VEGF expression by shear stress, which appears unorthodox because VEGF is up regulated by hypoxia-inducible factor (hif), but also by changes in glucose concentration, in reaction to lowered oxygen tension , which is high in arterial endothelium. A plausible explanation for the interplay of factors might originate at shear stress activated eNOS which induces VEGF which in turn induces MCP-1 in SMCs which attracts monocytes which produce GFs and arteriogenesis can be blocked at each mentioned point. The action of growth factors, especially the FGFs and VEGF, but also of the pleiotrophic heparin binding growth factor Midkine are modulated by the syndecans (1–4), glycoproteins that act as co-receptors, especialy for G-protein-coupled receptors [27, 28]. An ideal candidate for an endothelial FSS-activated smooth muscle mitogen would be endothelin 1 . Endothelin mRNA indeed reacts in our experiments to FSS in a quantitative way, i.e. moderate increase after simple femoral artery occlusion and marked increase following shunt induced maximal shear stress whereas in experiments of other groups it reacts mainly to changes in pressure . However, endothelin is a strong antagonist of NO (and vice versa) [12, 158] but NO is essential for arteriogenesis. However, the observed increase of endothelin occurs late during the maturation phase of the collateral vessels where an antagonist of NO would be needed. Another NOS inhibitor is hepatocyte growth factor (HGF), which is produced by MCP-1 activated monocytes . However, HGF is not a known mitogen for SMCs but it is angiogenic and a mitogen and motogen for endothelial cells . Uninhibited NO production could potentially further stimulate collateral vessel growth. A similar effect could potentially be induced by inhibition of enzymatic degradation of sGMP, the intracellular transmitter of NO. Indeed, sildenafil, a blocker of PDE-5, was reported to stimulate arteriogenesis [111, 134]. In our own experiments in an ischemic rabbit hind limb preparation and with oral administration of high doses of sildenafil the effect was marginal, probably caused by the unknown pharmacokinetics in that species. As discussed above, the arteriogenic process is initiated by a sudden increase in shear stress. Shear stress is sensed and transduced from the extra-cellular space to the intracellular skeleton. Communication between ECs and SMCs as a transverse signalling across the vessel wall is required to initiate the proliferation process. All these steps rely on cell-cell and cell-matrix interactions. Cellular effects of the extracellular matrix are primarily mediated by integrins. Among the many different isoforms αVβ3 integrin is involved in angiogenesis  as well as macrophage adhesion and migration . αVβ3 integrin turned out to be selectively increased in the wall of growing collateral arteries during the first 3 days after occlusion . The specific localization of αVβ3 integrin signals in the abluminal surface of the endothelium is consistent with observations, which were obtained in vitro . However, increased expression under the influence of high flows shows integrin protein enwrapping all vascular cells, which could explain the problem of early signal transmission across the internal elastic lamina before that is destroyed by the action of elastase secreted by monocytes. Nevertheless its main ligand vitronectin seemed not to be involved in arteriogenesis . In contrast we found the integrin ligand fibronectin up-regulated in shunt-treated growing collaterals. Interactions between fibronectin and some syndecans can be modulated by components of the extracellular matrix proteins. Midkine, a heparin binding growth factor is a ligand of α4β1- and α6β1-integrins . Notch (receptor) in the SMCs and Jagged or Delta (ligands) in the endothelium are membrane bound proteins, mediating signals between cells in contact. Fernandez and Broich already assumed a special relevance of the Jagged/Notch signalling in embryonic development of collateral arteries, as they have found consistent, time-dependent, and cell-type restricted regulation of Jagged and Notch protein expression during the growth of collateral arteries . Limbourg et al. have shown that the ligand Dll1 regulates Notch signalling-dependent Ephrin-B2 expression and heterozygous Dll1 mice show impaired arteriogenesis. They could demonstrate that angiogenic GFs like VEGF and FGF-2 regulate Ephrin B2 expression via Dll1-dependent Notch activation . Interaction between endothelial arterial expressed EphB2 (that we found up-regulated under high shear stress) and Eph B4 receptor, which is expressed by venous endothelial cells, regulates the integrity of the vessel wall, which has to be preserved throughout the remodelling process . Electric currents or signalling molecules such as Ca2+ or IP3 between the ECs and SMCs could be explained via gap junctions located at the smooth muscle-endothelial interface called myoendothelial junctions (MEJ). Although the functional evidence argues strongly for the presence of these MEJ, ultrastructural evidence for their existence in coronary as well as in peripheral collateral vessels is lacking. At least their frequencies are too low to explain the signal transduction between endothelial cells (EC) and SMCs. Connexins are proteins that form gap junctions. Cx37, Cx40, Cx43 and Cx45 have been identified in vascular cells, but the relative expression level differs with vessel size/ location and species. Even the flow pattern seems to have effects on connexin expression . In the normal dog coronary system Cx37 and Cx40 were only expressed in ECs while during collateral growth SMCs, normally devoid of a junctional system, strongly express Cx37 . An interesting idea is the evidence indicating that connexin proteins might also participate in cell-cell communication via direct, transcellular protein-protein interactions. The C-terminal portion of the connexins is associated with a variety of cytoskeletal proteins and, in conjunction with N-cadherin, is linked to a number of cell signalling cascades . The enormous increase of collateral vessel density and caliber and the drastic increase in function seen in the shunt model raised the question about the nature of the molecular pathways that had translated FSS into a growth signal. We studied gene expression in these rapidly growing vessels in the rat by genome-wide screening of transcripts using micro-arrays. Among the over 300 differentially expressed genes we found several of the known stress-responsive genes differentially expressed (klf2 [31, 40, 149], VEGFR/PECAM complex , TRPV4 calcium channels [141, 155]). We concentrated on the NOS isoforms because we had previously found that the NOS inhibitor L-NAME markedly inhibited the effects of increased FSS [35, 125]. And indeed we found the transcripts for eNOS, iNOS and nNOS significantly up-regulated both on the transcriptional as well as on the translational level. These findings posed riddles because NO is a powerful anti-mitogen [15, 70, 71]. The anti-proliferative actions of NO were even used to successfully battle restenosis, based on intimal SMC proliferation , after experimental angioplasty [22, 103]. The antimitotic actions of NO are dose dependent, at least in cells of the CNS that were treated with the synthetic NO donor detaNONOate: low doses of detaNONO are mitogenic but high doses are antimitotic . These effects could be modulated by intracellular calcium concentrations. A similar pro-mitogenic effect was obtained with sodium nitroprusside in endothelial cells of the fetoplacental artery via the MAPKinases ERK-1,-2 . Given the strong inhibitory actions of NOS antagonists it appeared logical to study mice with genetically targeted deletions of the NOS isoforms. However, surprisingly, we found that eNOS knockouts exhibited normal collateral vessel growth after femoral artery occlusion and showed delayed recovery only because of the prevailing intense vasoconstriction, which was easily neutralized by NO-donors [35, 71, 94, 125]. Only the additional inhibition of iNOS in eNOS ko mice inhibited arteriogenesis to a degree that led to auto-amputation (Schaper, submitted). L-NAME inhibits also iNOS, which explains our results with L-NAME in the shunt experiments. Irrespective of source, NO is an essential link in the pathways leading to arteriogenesis. It may originate also from the monocytes/macrophages in the peri-vascular space where they are activated in an autocrine way and stimulated to produce mitogens. These results also explain another spurious paradox, i.e., the non-involvement of Akt , necessary for the activation of eNOS  in our shunt studies. It is of interest that for the experimental treatment of cancer both eNOS and iNOS must be inhibited to achieve an anti-angiogenic as well an anti-arteriogenic effect . An important discussion point is the question of which comes first in the reaction to FSS: NO or VEGF-A? Both are known to be early responders and the arteriogenic actions of both can be stopped by inhibitors. But what induces what? From a physiological point of view NO must come first because the immediate effect of a step change in flow occurs within seconds and is NO-triggered vasodilatation [6, 109]. However, maximal phosphorylation at Ser 1177, a prerequisite for eNOS to become active, requires 5 min and Ser 116 de-phosphorylation requires 30 min, too long to explain the acute hemodynamic effects of NO but perhaps adequate for the transformation by growth . It should also be noted that ischemic tissue is able to produce NO by a non-enzymatic route . All these studies emphasize the essential role of NO and it appears feasible that soon an NO releasing chemical will be available for clinical testing to stimulate arteriogenesis. We have tested new direct and indirect NO donors and found them to be impressively arteriogenic. The angiogenic and arteriogenic functions of NO were inferred on the basis of inhibitor studies prior to our results by Matsunaga  who also reported about the interaction between VEGF and NO. Even before that Guzman in 1997 reported the abrogation of structural dilatation of arteries in arterio-venous shunts by L-NAME. However, none of these authors provided explanations or hypotheses about the mechanisms of action of the anti-mitogen NO in a process that totally relies on smooth muscle mitosis. The role of NO in angiogenesis was discovered by Ziche already in 1994  and recently the molecular pathway was described on the basis of targeted deletion of Rac-1  a Rho-family member. With our studies in shunt-stimulated collateral growth we also described the involvement of the Rho-pathway in the expression of ABRA, an actin-binding protein strongly up-regulated in arteriogenesis. Arteriogenesis is also inhibited by the Rho antagonist Fasudil . Most of the research in vascular remodeling had concentrated on the endothelium, which indeed plays a major role. However, the SMCs of the media are responsible for most of the remodeling process of the new artery. The marked changes from a contractile to a synthetic and proliferative phenotype, the digestion of the internal elastic lamina and the digestion of the extra-cellular matrix, which allows motility are much more profound compared to the mild morphological changes that characterize the endothelium [117, 122, 129]. Motility is also influenced by massive changes in the expression of integrins and the focal adhesion kinases . The stresses that arterioles undergo, that normally do not exhibit contacts between endothelial- and SMCs because of the interposed internal elastic lamina, may have triggered the expression of connexin Cx37 in SMCs, which was formerly only weakly expressed in endothelium [18, 19]. The molecular changes in smooth muscle dominate also the genomic screens with the high expression of structural genes, in particular smooth muscle actin, its degree of polymerization and the numerous molecules that bind actin at various stages (abra, cofilin , tsmb4 , destrin ). All these changes point toward a potent mitogen for smooth muscle, the identity of which is not yet known. An interesting hypothesis is that the products of elastin cleavage, caused by monocyte-derived proteases, are mitogenic and that the loss of cell-to-cell contact itself triggers mitosis of SMCs. Our studies with heterozygote deletion of the elastin gene in mice showed accelerated arteriogenesis (Szymanski et al. unpublished). Elastin digestion is one of the prerequisites for positive remodeling. We should keep in mind that situations exist where SMCs proliferate in the absence of GFs . The translation of the shear stress signal into a molecular pathway resulting in the activation of genes coding for proteins that enable arteriogenic remodeling is only incompletely understood. In-vitro results from stressed cultured endothelium are difficult to translate into an in-vivo situation where the shear forces are so much higher. Furthermore, stressed endothelium has to communicate with the underlying smooth muscle layer from which it is normally separated by the internal elastic lamina. None of the known endothelial stress-responsive proteins (klf2, Tzima-complex , ion channels, etc) explain the proliferation of the SMCs of the media but oxygen based radicals generated in response to mechanical stress may reach the SMCs and activate the transcription factor AP-1 which in turn induces MCP-1 etc., . Activation of transcription factors by radicals would obviate the need for mitogens, which is in some contrast to the findings by our group that showed strong up-regulation of the MAPKinases ERK-1/ERK-2, which transmit mitogenic messages from cell membrane receptors to the nucleus [35, 125] (see Fig. 1). Among the transcription factors involved in arteriogenesis AP-1  and the “early growth response gene”, egr-1  play a prominent role because they are activated by the MAPKinases ERK-1,-2 and control the expression of GFs and adhesion molecules as well as chemokines for mononuclear cells . Fittingly, egr-1 knockouts exhibited a significant delay in the blood flow recovery after femoral artery ligature . We constructed an egr-1 reporter mouse by coupling of the egr-1 promoter to luciferase and studied the animals in a ccd black box in the hope to identify growing collaterals in a non-invasive way. But mainly skeletal stress points (jaws after feeding) lighted up after injection of Luminol partially confirming our hypothesis that mechanical stresses are inducers of egr-1. NOS antagonists drastically abrogate ERK activity, which argues for an indirect influence of NO on a mitogen-releasing cell. Another pathway that seems to play a role is Rho signaling which appears to be tightly coupled with the changes of actin polymerization that is typical for arteriogenesis. A co-transcription factor that exhibits the highest up-regulation (over 40-fold) in growing peripheral collateral vessels in mouse, rat and rabbit is cardiac ankyrin repeat protein carp (ANKRD1) . The function of carp [26, 173, 174] in the adult organism is unclear. During embryonic development it regulates the expression of GFs. Its up-regulation during adult arteriogenesis may signify a recapitulation of embryonic mechanisms. Carp was found to co-localize with α-actin in intimal SMCs in human atherosclerotic lesions and could be induced by activin, a member of the TGFβ family in experimental atherosclerosis . Structural similarities suggest that carp belongs to the early response genes, which would partly explain its massive upregulation immediately following arterial occlusions . Targeted deletion of the three isoforms of ANKRD1 showed no delay in blood flow recovery after femoral artery occlusion . The clinical field of arteriogenesis is well covered by excellent reviews [82, 131, 135]. Today clinicians use techniques and insights gleaned from experimental work and collateral hemodynamics can now be studied in the beating hearts of fully conscious patients. The roles played by monocytes are fully recognized and are explored in studies making use either of the paracrine action of monocytes in adult stem cell applications, by chemokines that prolong the function of monocytes like GM-CSF or G-CSF  or by studying the gene expression of monocytes  with the question in mind why only relatively few patients are able to develop collaterals in spite of the fact that all human hearts possess the precursors of grown collateral arteries. Although these studies have produced interesting results it must be kept in mind that the development of collaterals needs time, which is not granted in a situation of acute thrombotic arterial occlusion. Those patients with a well-developed collateral circulation may have profited from a gradually developing stenosis via slow growth of mural thrombi and not necessarily from a fortuitous pattern of gene expression of monocytes. In summary we have unraveled pathways essential for arteriogenesis that converge to remodel a preexistent arteriole into an artery. These pathways originate at the shear stressed endothelium which attracts bone marrow derived cells that produce GFs in response to NO and VEGF and lead to powerful remodeling mainly of the smooth muscle layer of the media resulting in a manifold increase of the arteriolar diameter able to deliver bulk flow to jeopardized tissue. The multitude of morphological, protein-biochemical and molecular changes seen in SMCs of developing collaterals are of considerable interest but they are only the consequences of the fundamental event that occurred with mitogenic stimulation which is still in need of unraveling.